In our most recent survey, we asked: Is the American Dental Association dominated by specialists who are trying to promote their own agendas and not necessarily the welfare of the general dentist? 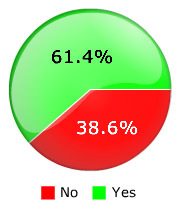 Wow – this is certainly a divisive issue! To see how polarizing this issue is, just look at the responses of general dentists as compared to specialists. 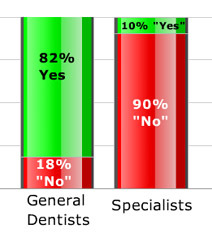 General dentists were 8 times more likely to criticize the ADA than were specialists! While it’s not surprising that the two groups responded differently to a question about the ADA’s relationship with specialists, the difference between the two is particularly dramatic. Many readers commented on the troubled relationship between generalists and specialists – two closely related groups of dentists who have to cooperate but also can’t avoid competing. Whew! – passions run high where the ADA is concerned! Here are just a few of the many comments we received on this hot-button issue.